The way things are going, it’ll be pretty foolish to pick any team NOT named Talk N Text to romp through the competition and lift the Philippine Cup trophy. The Texters lost just two games in the elims, and they are one of only two teams with 3 or more players in the Top 15 of the Player Efficiency ladder (the other team is Alaska). And none of those players is even Jimmy Alapag. Their opponents in the quarterfinals are the Air 21 Express, who lumbered into the Final 8 after beating the Batang Pier last Wednesday and after the Energy Colas lost to Rain or Shine two days later. Niño Cañaleta exploded for 40 points in the Express’s win over Global Port, and coach Franz Pumaren will need him to be just as sharp against the deep roster of coach Norman Black. In the next bracket, the 4-5 match-up pits the Meralco Bolts against the Alaska Aces, with both teams carrying identical 8-6 slates. They split their season series, with the average winning margin standing at just 5 points. With arguably the two top rookies (Meralco’s Cliff Hodge versus Alaska’s Calvin Abueva) going head-to-head, this should be one of the most exciting series to watch. Both teams are entering the Playoffs on winning streaks, but I think the Bolts should have a bit of an edge after beating the Mixers. This should be fun, and it should go the distance. The other best-of-three series will pit Rain or Shine against Ginebra. Ginebra has the edge in depth, but RoS has more grit. One interesting thing here is the chemistry between Mark Caguioa and LA Tenorio. Their combination hasn’t performed as strongly as, in theory, it should, but that may change when the stakes get higher. Right now, the Painters aren’t exactly doing well, too. They lost to the Kings and the Mixers before romping over the lowly Colas. Like the previous match-up, this, too, should go all the way to a third game. 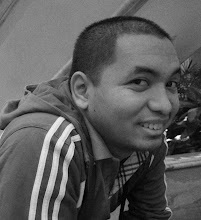 I’m picking the Caguioa-Tenorio combo to finally kick into high gear and the Kings to move on. Whoever moves on in that match-up will have a tough time in the semis, since they’re bound to face either the Mixers or the Boosters. In their only match-up in the elims, the Mixers practically dominated the Boosters until Petron made a rally in the fourth period. June Mar Fajardo put up a huge double-double, but his effort was pretty much negated by the great game of Yance De Ocampo. That will be a key match-up here along with those of Arwind Santos against Marc Pingris and the duo of Chris Lutz and Marcio Lassiter, who didn’t play in the first meeting, versus San Mig’s James Yap and PJ Simon. I think the Mixers are going to be a little too tough for Petron, even if I’m expecting Santos to have another big game. The Mixers need only one game to advance. Rain or Shine coach Yeng Guiao was caught in heavy Friday traffic, failing to make it in time for the start of the Elasto Painters’ match against Barako Bull at the SM Mall of Asia Arena. But Guiao had specific instructions for chief deputy Caloy Garcia — starting the game with seldom-used Jonathan Uyloan before bringing in the returning Paul Lee at the six minute mark in the first quarter — and the tactical moves worked to perfection in an easy 116-101 victory. Uyloan played the game of his career, finishing with 18 points, three steals, and two blocks, while Lee played as if he hadn’t missed Rain or Shine’s past 18 games dating back to last season, contributing 16 points, six assists, and four rebounds. They led six players who scored in double-figures as Rain or Shine finished the elimination round with a 9-5 record. “Unexpected naming ma-le-late si Coach Yeng, but when he called up, we thought na baka hindi na siya umabot,” said Caloy Garcia, who took over the reins of the squad. 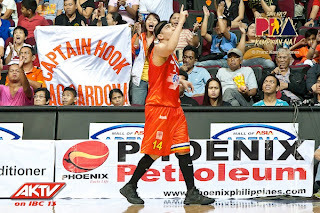 “His first instruction when he called up is to field in Paul Lee after six minutes, then have Jonathan starting for us. 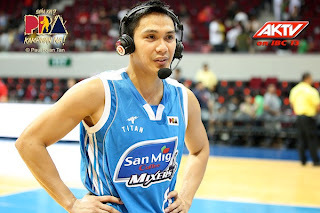 Jervy Cruz also scored a career-high 23 points on 10-for-17 shooting from the field. Jeff Chan and JR Quinahan each had 11 points while Beau Belga chipped in 10 for the Elasto Painters. The loss eliminated Barako Bull (4-10) from playoff contention, giving the Air 21 Express (5-9) the last ticket to the quarterfinals. ROS 116 – Cruz 23, Uyloan 18, Lee 16, Chan 11,Quinahan 11, Belga 10, Tiu 8, Norwood 8, Rodriguez 4, Arana 4, Jaime 3, Matias 0, Tang 0. BAR 101 – Seigle 21, Tubid 17, Yap 16, Kramer 15, cruz 13, Anthony 11, marcelo 8, Najorda 0, Pennisi 0.
clash with the Gin Kings. Needing to win one win to secure the twice-to-beat prize for the Philippine Cup quarterfinals, San Mig Coffee coach Tim Cone knew his team would to struggle for it. The Coffee Mixers did it the hard way, hacking out a 107-96 win against a GlobalPort squad that fought hard despite playing merely for pride Friday night at the SM Mall of Asia Arena. Peter June Simon came up big, picking up the slack for the hurting James Yap with 27 points to lead the way for the Mixers, who formalized their hold of the No. 2 spot in the quarterfinal round. “I know it wasn’t pretty, but it’s a lot harder than what people see from the outside,” said Cone. San Mig Coffee did not get its rhythm going until the early part of the fourth quarter, when the Mixers outscored the Batang Pier, 34-18, to secure their 10th win in 13 games. “We just took care of business tonight. I told my players that all we have to do is walk out there and win. Let’s not misunderstand our expectations. We don’t have to win by 25 points, but we only need to win by one and win,” said Cone. The Mixers still have one game left on their elimination round schedule against the Meralco Bolts, but are locked into a playoff duel against the underachieving but dangerous Petron Blaze Boosters. “Anybody could pick a harder opponent, but Petron. There’s a saying that you don’t choose who to play in the playoffs because you need to go through everyone of them,” said Cone. GlobalPort ended its campaign with just a lone win to show in 14 games. SMC 107 – Simon 27, De Ocampo 18, Pingris 14, Barroca 12, Ramos 8, Yap 8, Reavis 7, Devance 5, Intal 4, Villanueva 4, Gonzales 0. GLO 96 – David 22, Al-Hussaini 20, Deutchman 13, Miller 13, Mandani 10, Salvador 6, Guevarra 4, Raymundo 2, Manuel 2, Lingganay 2, Yee 2, Vanlandingham 0. 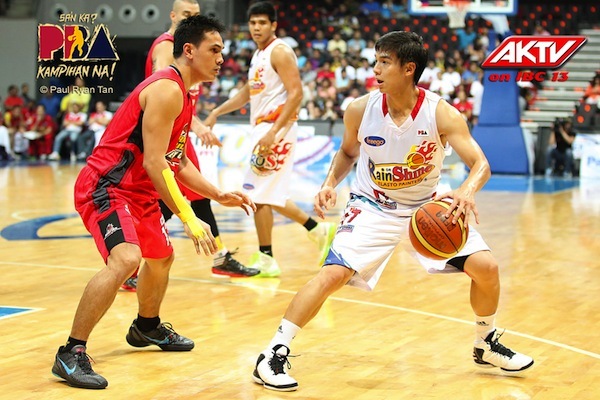 PJ Simon shone brightly in the absence of James Yap. The Meralco Bolts took care of business Sunday, defeating the San Mig Coffee Mixer 87-77 at the SM Mall of Asia Coliseum to set up a quarterfinals showdown against the Alaska Aces. With the Mixers already safely ensconced in the quarterfinals — San Mig Coffee coach Tim Cone opted to rest hurting superstar James Yap — it was the Bolts who dominated the game for their eighth win in 14 contests. Veteran forward Reynel Hugnatan led the way with 15 points and nine rebounds for Meralco, which finished with the eliminations with the same record as the Aces. The two teams will start their best-of-three playoff encounter on Wednesday. “We really put our spirit to a test. We wanted to come up with our best finish for our young franchise and break some barriers. True enough, we finished No. 4,” said Gregorio. The smaller Bolts had to outwork the bigger Mixers. Meralco outrebounded San Mig Coffee, 57-43. “We’re a small team, so we have the mindset of rebounding by committee and that’s exactly what we did tonight. 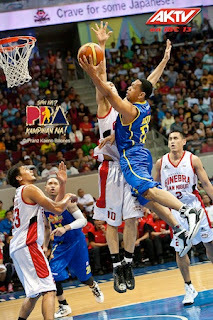 In fact, we had six offensive rebounds to end the game,” said Gregorio. It was Hugnatan who hurt the Mixers’ more with his hustle plays and timely baskets. He had eight points in the fourth period, including an inside stab off a pass from Mercado that gave the Bolts an 83-71 lead, 4:11 left. Meralco’s victory means Rain or Shine will face Barangay Ginebra San Miguel in the quarterfinals in another best-of-three series. Both of those pairings will kick off Wednesday at the SMART-Araneta Coliseum. San Mig Coffee, meanwhile, will have twice-to-beat advantage in the quarterfinals against Petron in the series that begins Thursday, also at the Big Dome. MER 87 – Cardona 15, Hugnatan 15, Mercado 12, Borboran 9, Buenafe 9, Reyes 8, Sharma 7, Hodge 5, Salvacion 3, Nabong 2, Ross 2, Bulawan 0. SMC 77 – Simon 19, Ramos 15, Barroca 8, Pingris 8, De Ocampo 8, Gaco 5, Devance 4, Intal 3, Ponferada 2, Villanueva 2, Gonzales 2, Reavis 1, Pacana 0.
prepare for war versus the Aces. The Talk ‘N Text Tropang Texters rallied to beat Barangay Ginebra San Miguel, 87-80, Sunday night at the SM Mall of Asia Arena to ride into the Philippine Cup quarterfinals with a victory under their belt. Ali Peek had 16 points, 18 rebounds, and three blocks to lead Talk ‘N Text, which came back from a 17-point third quarter deficit to book the victory. The game held little meaning for either team, as both were locked into their respective quarterfinal matchups. But the two squads didn’t play like it was a no-bearing game, with the action getting heated at several junctures. “There’s no such thing as a non-bearing game. The objective is to always give the paying customers their money’s worth. I’ve been long enough in the league and I know our priority is the customers and win basketball games for them. We all owe it to the fans,” said Talk ‘N Text coach Norman Black. The Tropang Texters worked double time on defense in the fourth period, when they held their rivals to just two field goals. 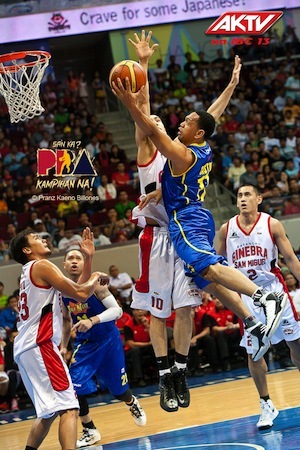 Barangay Ginebra’s seven-point output in the final period is the team’s lowest scored this conference. The Gin Kings’ last field goal came at the three-minute mark of the fourth quarter courtesy of Rico Maierhofer. Talk ‘N Text finished with just two defeats in 14 elimination round games, while Ginebra’s win-loss record fell to 7-7 to wrap up its campaign. The Tropang Texters will play Air 21 in the quarterfinals, with the Tropang Texter enjoying twice-to-beat advantage. The series starts on Thursday. “You can’t take any team for granted. I believe they’re better than their record,” said Peek. Ginebra will take on Rain or Shine in a best-of-three series that kicks off Wednesday. It marks the second straight year the two teams face each other in the Philippine Cup quarterfinals. The Elasto Painters swept the Gin Kings in two games last season in the final eight of the same tournament. TNT 87 - Castro 24, Peek 16, Williams 13, Fonacier 11, Reyes 8, Alapag 6, De Ocampo 4, Aban 3, Dillinger 2, Ferriols 0, Carey 0. GIN 80 - Caguioa 20, Tenorio 19, Raymundo 10, Maierhofer 4, Mamaril 4, Hatfield 4, Ellis 3, Labagala 3, Helterbrand 3, Taha 2, Jensen 2, Maliksi 2, Espiritu 2, Wilson 2.
the Texters finish the elims strong.